Marriott International, the world’s biggest hotel chain, launched the Sheraton Grand Bengaluru Whitefield Hotel & Convention Center, becoming the first global hospitality group to reach the 100 hotels milestone in India and inching closer to its Indian rival, Indian Hotels Company, in terms of properties in the country. IHCL has 129 hotels in India, including its budget brand Ginger with about 14,400 rooms. However, Marriott beats IHCL in number of rooms. 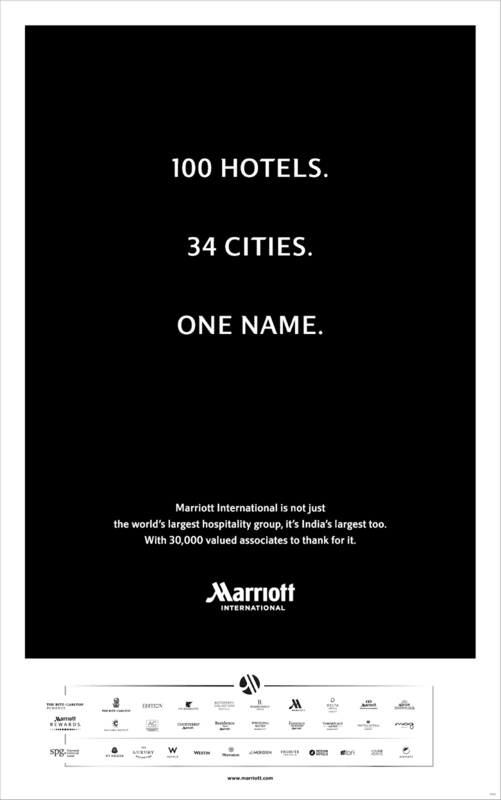 Marriott's 100 hotels are roughly (equivalent to) 22,000 hotel rooms. In a landmark deal that changed the dynamics of the hospitality industry, Marriott had bought Starwood Hotels and Resorts Worldwide for about $13 billion, a move that brought together its Marriott, Courtyard, and Ritz Carlton brands with Starwood’s portfolio of brands like Sheraton, Westin, W and St Regis. The company said demand is also growing for its upscale and luxury brands. Marriott has three Ritz-Carlton projects under development in Pune, Mumbai and New Delhi.